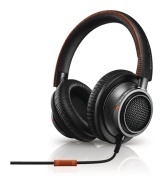 alaTest has collected and analyzed 236 reviews of Philips Fidelio L2. The average rating for this product is 4.4/5, compared to an average rating of 4.2/5 for other Headphones for all reviews. Views about the comfort and portability are generally positive. The bass quality and design are also mentioned favorably, whereas some have doubts about the price. We analyzed user and expert ratings, product age and more factors. Compared to other Headphones the Philips Fidelio L2 is awarded an overall alaScore™ of 87/100 = Very good quality. Somewhat pricey; inline remote lacks volume controls; downside to semi-closed design is that it leaks some sound. The Fidelio L2 doesn't usually get mentioned in the same breath as other top over-ear headphones in the $250-$350 range, but it probably should.